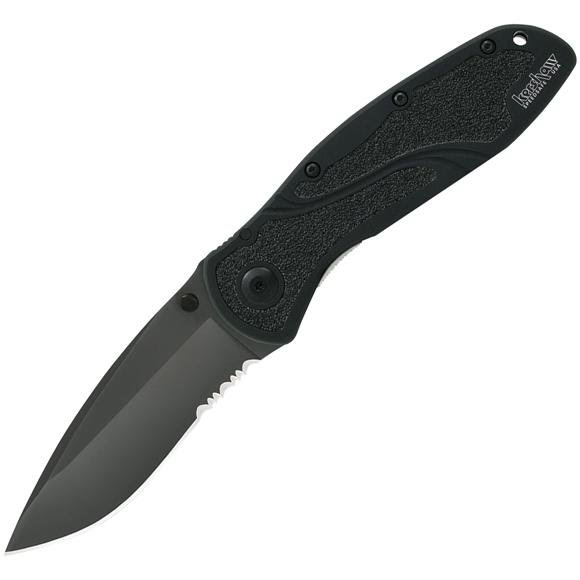 Kershaw's Blur solves the problem of secure knife control with a unique handle that features advanced materials to ensure a safe, secure grip every time, even under extreme conditions. The Blur also features incredible, multi-tasking performance, the highest quality materials, and the kind of good looks knife users will be proud to own. Kershaw&apos;s Blur solves the problem of secure knife control with a unique handle that features advanced materials to ensure a safe, secure grip every time, even under extreme conditions. The Blur also features incredible, multi-tasking performance, the highest quality materials, and the kind of good looks knife users will be proud to own. For smooth, one-handed opening, all Blurs are SpeedSafe equipped. The Blur&apos;s 6061-T6 aluminum handle not only precisely fits the user&apos;s hand for a comfortable, secure fit, but Kershaw also CNC-machines each handle to accept textured Trac-Tec inserts for a secure grip. Locks the blade into position after the blade is deployed. To release the locking liner simply press the spring loaded lock and the blade will easily fold back into the handle. This is a knob, disc, or an attachment to the blade near the handle of a folding knife that allows the user to open the knife using one hand. Many times this can be done with either the right or left hand on models that offer ambidextrous opening. The Kershaw pocket clip is just that, a pocket clip. It is not to be worn on the belt, as this can be an unsafe way to carry your knife. It is meant to be clipped with the handle on the inside of your pocket and the clip is on the outside of your pants. Many of Kershaw&apos;s models that come with clips can be kept all the way inside your pocket, as in rolling around the bottom of your pocket. It can also be used as a money clip. This clip may be removed if you choose. Overall Length 7.9", closed: 4.5"